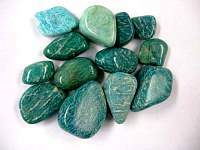 Such a gorgeous stone, and as with everything I've always purchased from Louise, the energy is just beautiful! Cute little stones. I ordered 3, and it's neat to see the li ..